Most widely known Thai dating site! ThaiCupid was the most well-known dating website in Thailand before ThaiFriendly surpassed it in 2014. ThaiCupid is no longer very popular in Thailand or with Thai women. 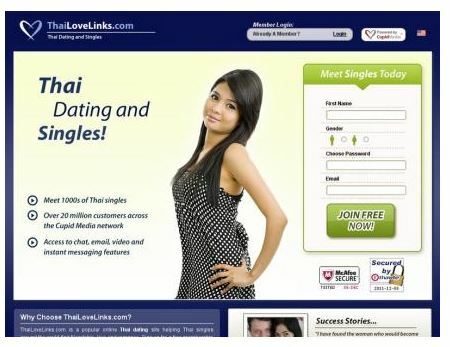 This same dating site used to be called ThaiLoveLinks.com. The website was founded in 2001 and is owned by Cupid Media, which is one of the biggest international dating companies around. ThaiCupid.com was the biggest Thai dating website on the web and has more than 770,000 active members. *Before you join I would suggest you read our summary page of the best Thai dating sites. The fact is in late 2013 and early 2014 most local Thai girls or women rather have switched to mostly just using 1 site. Find out which one it is here. Remember to share your own experiences by leaving actual past member ThaiLoveLinks reviews above. We use a star rating system that allows just 1 consumer review per IP to keep all dating site reviews honest and transparent!